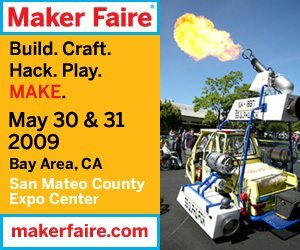 The Maker Faire is a celebration of innovation and initiative–for tinkerers, inventors, robotics-dorks and crafty folk of all kinds to demonstrate their pet projects and freak toys. Its kind of like burning man for legos, terrabites, bicycle wheels and blowtorches. Most of these projects are hobbies and fetishes, but the applications of their experimentation is most certainly relevant for the micro-economies and retrofit futurism of post-petroleum suburbia. We just have to train those robots to manage drip irrigation, and convince their inventors to collaborate in the ‘real world’. Maker Faire is interested to have more agricultural exhibitors, and Greenhorns has been enlisted to recruit! If you have a crafty skill and want to add your stone soup to the pot, you can contact them here. I’d say its a great place to insert yourself and your work, a good set of co-collaborators, and a fiesty nutrient matrix of mad geniuses to innoculate with the ethics of local food, and the reverence of soil + place. A warning, sometimes these folks are super duper into hydroponics–but they’re open minded. So go! May 30+31st to San Francisco, take your bike on the train to San Mateo. And bring add some agrariana to the steam punk and some jungle to the concrete. Does anyone know how to make BIOCHAR? ps Check out this eating mobile @ Gospel Flats Farm!